There is a saying that, “The most violent element in society is ignorance”. This is absolutely true. Let me cite an example to clarify this saying further. Jesmin Akter, an 18-year-old girl, was married off two years ago to Abdul Halim who lives in Bogura. Since then the couple was leading a happy conjugal life along with Halim’s mother. However the situation started changing when Jesmin got pregnant, one year after their marriage. At that time Halim and his mother started noticing some behavioural changes in Jesmin. She started overreacting and locking horns with her husband and mother-in-law, but still it was tolerable. After her delivery, the situation went beyond control as mental condition of Jesmin deteriorated, so is the relationship among them. The situation reached such an extent that Jesmin even stopped allowing anyone to touch her child (not even her mother-in-law). All these sudden changes were very noticeable but the knowledge was not available. Halim and her mother mistook Jesmin’s illness as something unnatural. Finally, her husband Halim now wants a separation as he believes that his wife is mentally unstable and it is impossible for him to continue living with her under the same roof. Unfortunately none of her in-law’s family members knows that Jesmin is simply suffering from a mental illness and that illness is very much curable. But due to their ignorance Jesmin is going to get separated now. There are thousands of similar examples who are undergoing such changes and social reality in our country. This particular situation, in medical term, can be called ‘postpartum or postnatal depression’. Well, we have two ways to look at this specific problem – one from the perspective of medical science and another from the context of our social reality. Let’s begin with the first one. Postnatal or postpartum depression occurs to some new mothers as a consequence of giving birth to a child. While the birth of a baby can trigger a jumble of powerful emotions, from excitement and joy to fear and anxiety, it can also result in something you might not expect - depression. Most new moms experience postpartum ‘baby blues’ after childbirth, which commonly include mood swings, crying spells, anxiety and difficulty sleeping, that typically begin within the first two to three days after delivery, and may last for up to two weeks, but some new moms experience a more severe, long-lasting form of depression which medical science defines as ‘postpartum depression’. Symptoms usually develop within the first few weeks after giving birth, but may begin earlier during pregnancy or later up to a year after birth. 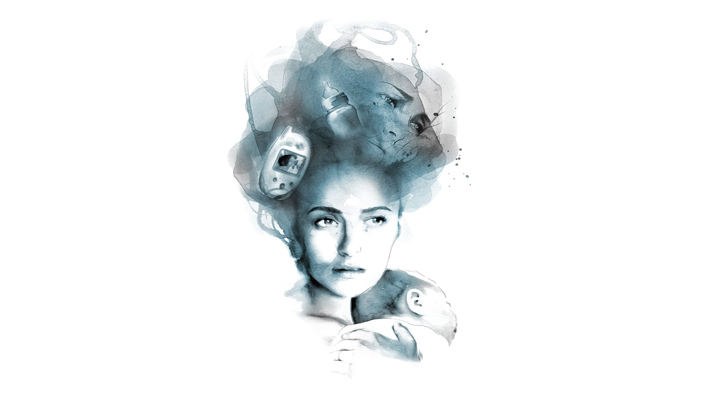 Symptoms of postpartum depression includes difficulty sleeping, appetite changes, excessive fatigue, decreased libido, and frequent mood swings and these may be accompanied by other symptoms like depressed mood, loss of pleasure, feelings of worthlessness, hopelessness, and helplessness, thoughts of death/suicide or thoughts of hurting someone else. It is mentionable that in Bangladesh 14.1% women experience postpartum depression at 2-3 months, and 31.7% at 6-8 months. Now let’s try to consider this problem from our social context. The fact is that most of us (the male family members in particular) are not even ready to recognize such problem. In most of the cases family members and husbands do not extend any support to the new moms suffering from postpartum depression. People usually put the blame on new moms and insist on developing mental strength. Instead of lending a hand in raising the baby family members question the ability of the new mom to bring up a child and such inability is often labelled as very unexpected whereas in such situations the new moms need psychological support. Even the husbands fail to identify themselves with the wives. They feel that it is the duty of the mothers to take care of the newborn and it is something innate. So they think that no attention or psychological support or counselling is necessary for the new mom to cope with the changing situation. As a result the new mom feels very isolated and blames herself for the consequences or difficulties and such feeling results in depression among the new moms. Another problem is that as most of us do not recognize this problem, it causes further complications. The family members take the symptoms of postpartum depression as some kind of madness instead of evaluating these as signs of mental disorder. Thus without taking the victim to the doctor, they rather let the women go through such terrible experience which worsen the mental condition of the new mom. Consequently after some days family members become tired of that girl (new mom) and insist the husband on filing a divorce petition. Interestingly even in educated quarter of the society the family members sometimes do not identify this as a psychological disorder and ignore the fact that it can be recovered completely through proper treatment. However our society as a whole fails to a great extent to sympathize and empathize with the new moms. If we want to change this situation and help the new moms fight against anything like postpartum depression, we must, first of all, try to understand the problem. Questions like ‘why does it happen’ and ‘what to do in such situations’ need to be answered. Though there is no exact reason for experiencing postnatal depression, there are some factors that can trigger this problem. The first one is physical. After childbirth, a dramatic drop in hormones (estrogen and progesterone) in the mom’s body may contribute to postpartum depression. Other hormones produced by thyroid gland may also drop sharply - which can leave the mother feeling tired, sluggish and depressed. The second reason is psychological. According to different studies, women who had gone through any kind of depression or anxiety during the pregnancy have a high chance of experiencing postpartum depression. A complicated pregnancy or obstructed birth, an unexpected birth outcome and unrealistic expectations of motherhood from the family are other factors to look out for. The third and most important probable reason is social. Some of the expected mothers in our country have to go through a lot of worries, anxiety and fear, mostly related to poverty and insecurity in their lives. Mothers often attribute their worries to poverty and express feelings of not being able to provide their children with nutritious food or take care of them properly. Moreover, relationship problems with the spouse or other family members can also instigate such episodes of depression. Now if we look at the reasons, we can easily understand that the problem is not with the new moms rather the problem is with the ways we deal with such situation and the surroundings. The first thing that the mothers who experience postnatal depression need is help from the family members. They need help to recover from both their own physical weakness and their psychological and emotional suffering. After providing all the necessary support to the new mom if you still observe some symptoms, it probably means that you need to consult a doctor – nothing else. Proper treatment and psychological support are all that it takes to help a new mom out of postpartum depression.